What does the color of the light on the Hub mean? The indicator light on the front of the Hub’s dome offers you information about its current state. When you first start setting up your Hub, a blinking blue light means the Hub is in "listening mode" and ready to be set up using the CleverPet app. If you need to go through setup and the light is not blinking blue, follow the instructions here. After setup is complete, a steady white light means your Hub is successfully online and ready for play. 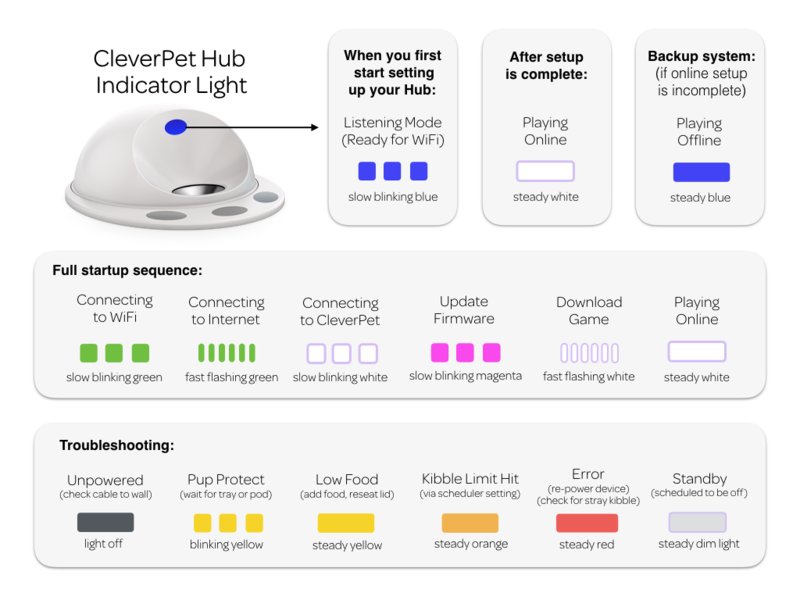 After your Hub is set up, the full startup sequence of lights is blinking green when it is connecting to WiFi, slow blinking white when it is connecting to the CleverPet cloud, and a steady white light when it is successfully playing online. A steady blue light means the Hub is playing, but in a limited offline mode. The Hub will revert to this mode if it doesn’t get online within about 10 minutes, and includes a limited set of the challenges. Learn more about why your Hub may be in offline mode here. You may also on occasion see a blinking magenta light when a firmware update is being sent to the Hub and a fast flashing white light when the Hub is downloading a new game. Light off means the Hub is not powered. Check the power cable at the wall and where it connects to the Hub. Slow blinking yellow is Pup Protect mode, which can happen if the tray senses some resistance while trying to open or close. Unless there's something permanently blocking it's path, it should recover within a few moments. Steady yellow means the Hub is low on food. Add more food, then either hit "resume play" in your app, open and close the dome, or unplug the Hub and plug it back in to signal that food has been added. Steady orange indicates that your dog has eaten his or her daily kibble limit. If you'd like to increase this limit, visit the scheduler settings in your app. Learn more about this feature here. Steady red indicates that either the tray or food pod cannot move. Learn more about how to resolve these issues in this article. Steady dim is standby mode, when the Hub is scheduled to be off. What if my Hub's light is a color not listed here? We've found the yellow indicator light appears a bit greenish. If your Hub's light looks steady green, you may need to add food! We've also found the dark blue indicator light looks a bit purpleish. If your Hub's light looks steady dark purple, it is most likely in Offline Mode. We've also found the white indicator light appears a bit blueish or purpleish. If your Hub's light looks pale blue or pale purple, it should be online and ready to play!